The wind howls around us in the dark, the rain starts to beat down on our backs as we, as fast as we can, hoist the dingy on to the davits, it looks like we could be in for another lively night. The wind has turned around to SE and our protected bay is becoming bouncy. We are still being held hostage by the weather, high winds restrict where we can anchor, the cloud restricts the visability and the rain restricts trips ashore and keeps us below decks. We have done a long list of chores, read a selection of books and watched our limited video stock all the way though for the third time. Now it is time for the squalls to stop, the sun to come out and the wind to drop so we can enjoy our fabulous surroundings, unfortunately the forecast is doubtful. We left Fare last Friday after just one night to hide from yet another forecast for high winds. We motored inside the lagoon, bordered on one side by the hills and bays of the island of Huahini and on the other the outer reef with huge perfectly formed surf crashing over it. The cloud subdued the colours and the current kept us focussed on the route, the fantastic scenery passed by mostly unnoticed. About four miles south we found a large bay, with just a small entrance, that was calm and to a degree protected from the wind. Bourayne Bay felt like a large lake, we were encircled by densely wooded hills a few hundred feet high, the water was deep, until a shelf, that stretched completely around the shore, rapidly shallowed the water to a reef that almost broke the surface. A few houses sat around its perimeter but we saw very few people, just a couple of locals fishing once in a while, when there is a lull in the wind it was beautifully tranquil. With time on our hands we enjoyed watching the weather. The wind that sweeps across the surface of the water, the ripples identifying its path. The rain a wall of water bearing down on us, reducing the visability to a few metres and then the short breaks in the cloud, allowing the sun in to light up and to transform the landscape. We turn on the instruments to monitor the gusts, we see 20, 24 even 27kts, we track our path around our anchor, uncomprehending at the effects of the wind and currents on the pattern that is formed. 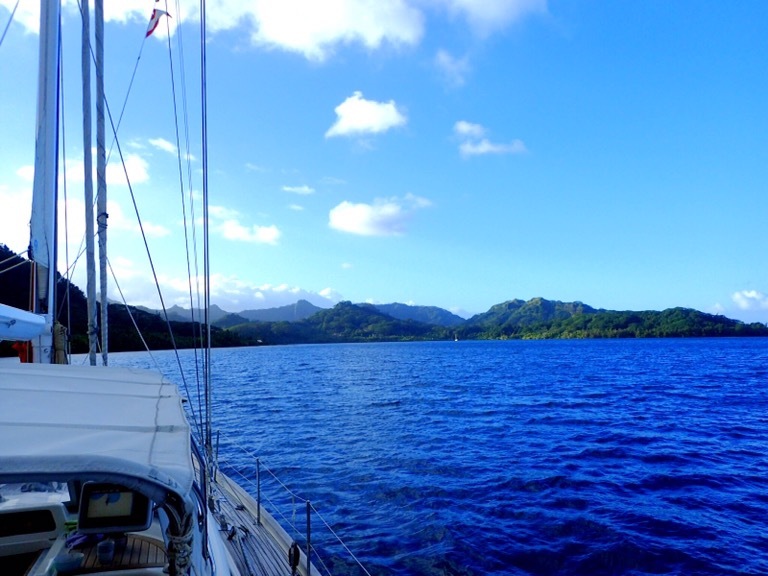 After three days the wind drops a little and we carry on down the lagoon to Avea Bay. A bigger contrast you couldn’t get, Avea Bay is fringed by a long sandy beach, buildings regularly puntuate the shore, a small hotel sits opposite us. The sandy bottom produces bright blue water that as you look out to sea turns to a turquoise strip in front of the reef. Outside the reef is the ever present line of white, the surf continuing to pound in from the ocean. Conditions are still squally but there are periods of sunshine to take advantage of, we take the dingy in to the pretty hotel Le Relais Mahana, for lunch. The Mai Tais were expensive, rather sweet and wishywashy, the food was good however and the view gorgeous. The next day we go to explore the point at the end of the bay. We beach the dingy and walk along the sand, marvellous craggy trees lie low over the water. As we round the corner we are surprised to find large break waters built of giant boulders stretching out into the sea, more of the same have been used to create a wall. It is a major feat of construction, some one is trying hard to hold back the encroaching ocean. Set into the wall are two entrances from the sea each flanked by two proud Moai (traditional Polynesian staues), steps lead up to the community pavilions that are common here and the grounds are well tended but the buildings look abandoned and in disrepair. Nobody is around, a large sign says Private, we return to the dingy questions unanswered. Curious buildings and wall at far southern tip of the island. Back at the beach I swim out to the coral to assess it for snorkelling, the tide has changed and the water is racing from the ocean back into the bay. Rick drives the dingy while I fly along the shore travelling too fast to really see the small fish clustered around the bommies but the feeling of speed is so exhilarating I don’t mind. Approaching the bay the current and the coral stop and I swim to the dingy, it is shallow I could easily walk but the sea bed is covered with thousands of sea cucumbers (large slug shaped creatures about a foot long and belonging to the same family as star fish), I prefer not to put my feet down. We race back to Raya the sky is turning black and the wind is whipping up the sea. We tie up and dodge below, clean the galley, change the engine filters or watch Ground Hogday for the 650th time?